Handbags To Change Bags: We Love Babywearing, Do You? Since I've had Summer I've become a massive fan of babywearing which is where you carry your baby around in a sling or carrier instead of using a pushchair. I never really got into babywearing when I had my son but I was sent this gorgeous baby wrap carrier from Joy & Joe so I gave it a go with Summer and we both ended up loving it. 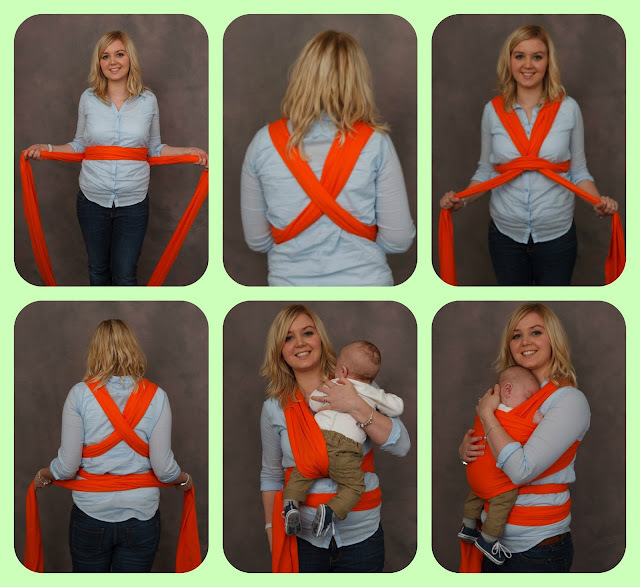 The baby wrap carrier is basically just a really long piece of super soft fabric that you wrap around your body in a specific way providing a feeling of being cuddled for your little one and allowing you to have your hands free. The wrap has a fab little pocket attached to it that you fold all the fabric into and it comes in some lovely colours and patterns, I chose a pretty floral one. I must admit when I first unwrapped the baby wrap and read the instructions I was a little daunted, it looked really complicated and I didn't think I'd be able to wrap it around myself properly without help but as it turns out it was actually really straight forward and easy to do by myself. You can buy your own baby wrap carrier from the Joy & Joe website for just £21.99 which I think it a complete bargain for such a brilliant product, I can't recommend it enough! What sort of baby carrier do you prefer? Leave me a comment and let me know! This wrap is so pretty! I've tried it with the wrap and the carriers, and it's just not for me. I feel like the baby is in the way and I feel very conscious of falling! And Tyne doesn't seem to like the wrap style. Awww the wrap is so cute - I definitely want to use one if I have another baba.